Sysessential for DBX to NSF Converter application is a recommended tool when users are searching for the best ways to export Outlook Express emails into Lotus Notes email application. A complete professional utility serves its purpose so well that users hardly come across any complications when it comes to use converted files into NSF file format. Sysessential for DBX to NSF Converter application is planted with easy functional properties which creates ease for users to carry out data migration from DBX files into NSF file format. Users can access the details of the DBX files before making full and final data convert. In addition to this, user can migrate only selected items rather than all. This will facilitate users with lots and lots of ease. The tool is embedded with expert solutions asit can efficiently move images, email properties, email attachments, images, folders etc into NSF file format. This creates an ease of converting complete data without leaving a single detail behind. The most modern technological features in the application is its ability to work in compatibility with all Outlook Express (6.0/5.5/5.0 and 4.0) and Lotus Notes editions 9.0.1/9.0/8/7/6). Users can make use of the software directly without worrying about the specific version compatibility. Software performs flawless mailbox data migration without affecting data integrity, metadata properties and formatting style. It is thus clear that software won’t cause any alterations in the data ahead. The features and functioning process is so effective that users feel satisfied with the obtained consequences. There is hardly any chance to get discomforted with the application at any point. Sysessential for DBX to NSF converter comes with the unique facility of saving NSF files into already existing NSF file or newly generated NSF file. This is like an extra benefit when it is to shape out data structure. The resulted file will not cause any hurdles at all. You are free to download software in freeware demonstration edition for testing purpose. This will assist you the ways to make out essential features instilled in the application. You will get familiar with the features and get to know latest functionalities used with the tool. The committed application is absolutely comfortable to operate. The cost of the software is affordable even when you have huge DBX files to be migrated into NSF file format. DBX to NSF conversion involves just few easy steps. Choose DBX files>> Preview the converted emails along with other data items>>Save selected data items. What is all about the feature of saving data into single NSF file? Sysessential for DBX to NSF Converter software is designed with peculiar features which are useful and beneficial in the long run. The application is supportive of saving data into new created NSF file or also into multiple files. The logic behind such saving option is to provide flexibility and freedom to users to choose the file saving option as per the need. By downloading free demonstration edition of Sysessential for DBX to NSF Converter, you are permitted to convert and save first 10 DBX emails into NSF file. However, full version can convert N number of DBX files into NSF file format. Demo edition is the most efficient way to check out features and functionalities of the tool prior final purchase. What is the storage capacity of Sysessential for DBX to NSF Converter on computer’s hard drive after getting done with complete installation? Software is extremely powerful way for supporting large sized DBX file. It is supportive of converting all the DBX files safely into NSF file format. Why Sysessential for DBX to NSF Converter preferable over other available email conversion options? Sysessential for DBX to NSF Converter tool is accurate result provider. The features are easy to understand that even less computer techies can implement the steps with no complexities. Is it possible to save converted DBX file into already existing NSF file? The possibilities are higher for saving DBX files into already existing NSF file. It is all up to user’s choice. 6. 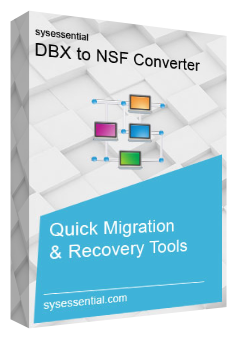 What are the prerequisites before running Sysessential for DBX to NSF Converter software? I work as a network admin for my company and it is my responsibility for securing transaction of the sensitive emails that come across company’s network. Because of this, we have planned for replacing the outdated MS OE with Lotus Notes. Even after so much planning, we stuck into DBX file conversion in NSF files. Then we got the chance to come across Sysessential for DBX to NSF Converter and it sorted out all our problems. The functions of the tool were manageable and sincere efforts of customer care team sorted out all the conversion hurdles. Fantastic software to work with! This is one of the best software solution used that impressed me. It rapidly converted all the emails from DBX file format into .nsf files. I was in need of such accurate result giver tool before shifting to a new email environment. As soon as I run the tool, it migrated all the emails via simple and easy to implement steps. Thanks for such a smart tool!